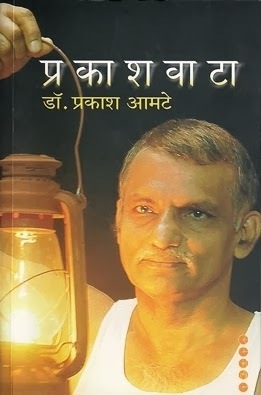 Summary: Autobiography of Magsaysay Award winner Dr. Prakash Amte (son of Baba Amte) who has devoted his entire life on the 'Lokbiradari Prakalp' project, working in the forest of Hemalkasa, district Gadhchiroli in Maharashtra, India. This 150 odd pages gem can simply change your perspective towards life, make you rethink on your definition of successful life and achievements. It will make you pause for a moment and introspect your life. To simply put he got his doctors degree, got married to another doctor, both went to the forest where no one would ever go, had no resources whats so ever, built a hut for self, learnt the language of the local Madiya Gond tribe and started giving the much needed medical help to them for free. Then he started free school for the children, zoo for the animals and did whatever it took to help those people. He just gave away his life for this purpose. Made every sacrifice for it. There is no ego, no bragging about these things in his writing. He has simply written the facts, gave credit to people who helped in the process. There are no opinions, no grudges, no dramatization of the hardships they faced. The book is as glamour-less as the life he has lived. Its crude and pure. And hence its condensed into 150 pages. या कॉलेराच्या साथीतील एक प्रसंग मनाच्या तळात असा जाऊन बसलाय की तो हटतच नाही. एक बाई एका लहान मुलाला घेऊन आली होती. उपचार केल्यावर, सलाइन दिल्यावर ते मुल जरा सुधारलं. त्याबरोबर तिने त्या मुलाला आमच्याकडे सोपवलं आणि ती लगेच जायला लागली. आमचा एक कार्यकर्ता तिला म्हणाला, "अशी कशी या मुलाला सोडून जातेस? त्याच्याजवळ थांब. त्याला पूर्ण बरं वाटलं की जा." त्यावर त्या बाईनं सांगितलं, "कॉलेराच्या साथीने काल माझा नवरा मेला. दोन्ही मुलांना लागण झाली म्हणून त्यांना घेऊन इकडे निघाले, तर एक मूल वाटेतच गेलं. त्याला तसंच झाडाखाली ठेवून याला घेऊन आले. आता याला जरा बरं आहे तोवर जाऊन त्याला पुरून येते." इतका करून प्रसंग होता हा! आम्ही सगळेच सुन्न झालो. कोण कोणासाठी रडणार? डोळ्यांतलं पाणीच आटून जावं अशी ही परिस्थिती. Can't forget one of the incidence happened during the cholera epidemic. A women came to us with her child. After treating him, giving him Saline the child's condition improved. Keeping the child with us, she immediately started to leave. One of our volunteer asked her, "How can you leave this child in such a condition? Stay with him, let him recover completely and then leave." On that she told, "Due to cholera out break my husband died yesterday. Both the kids got infected so I started to come here, but on the way one kid died. I kept him under the tree and came with this kid. Now while this kid is ok, I'll go and bury that kid." It was very depressing! We all were speechless. Who will cry for whom? Eyes had all dried up to cry. The book ends with how next generation has started contributing to the work and how things are done by them. They now have website called lokbiradariprakalp.org. Someday I would visit this place. Would like to see if I can be of any help. I'm Ganesh Pagade. I am a software professional from Pune, India and love to do computer stuffs.